gallamore west: Thanksgiving... Kindergarten Style! Sam has the BEST Kindergarten teacher ever. It's awesome, except I'm afraid no other teacher for the rest of his school life will compare! She put together the cutest Thanksgiving program and I had the pleasure of helping with the turkey leg hats and the dessert table. It was so cute listening to all of the kids on the microphone say what they were thankful for, especially our sweet Sam who said he's thankful for "My baby brother Luke, my brother Jake... and MYSELF!" 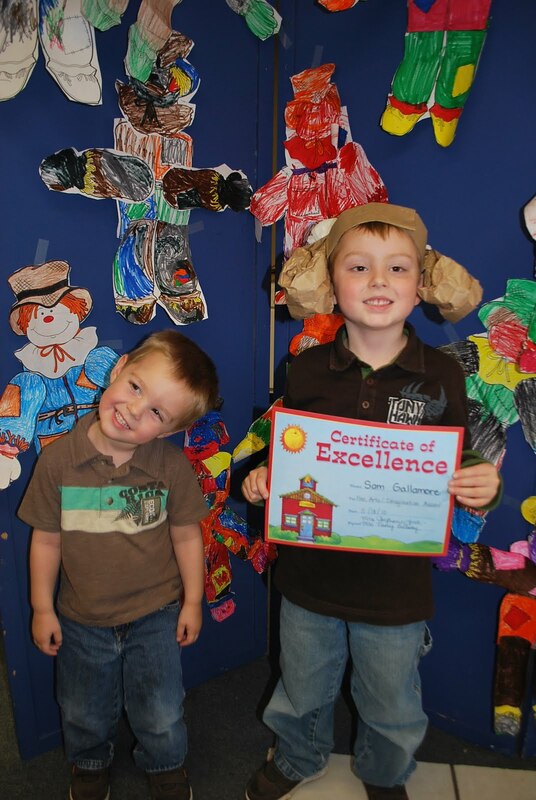 Sam received the Fine Arts/Imagination Award! Jake loved Sam's turkey legs hat. Little Man Luke was dressed for the occasion... front view. And the adorable rear view! It all turned out very cute. Good job on the cupcakes Laurie. You are right I don't think he'll have a better teacher!